Alaska: the commercial gateway to the American Arctic? 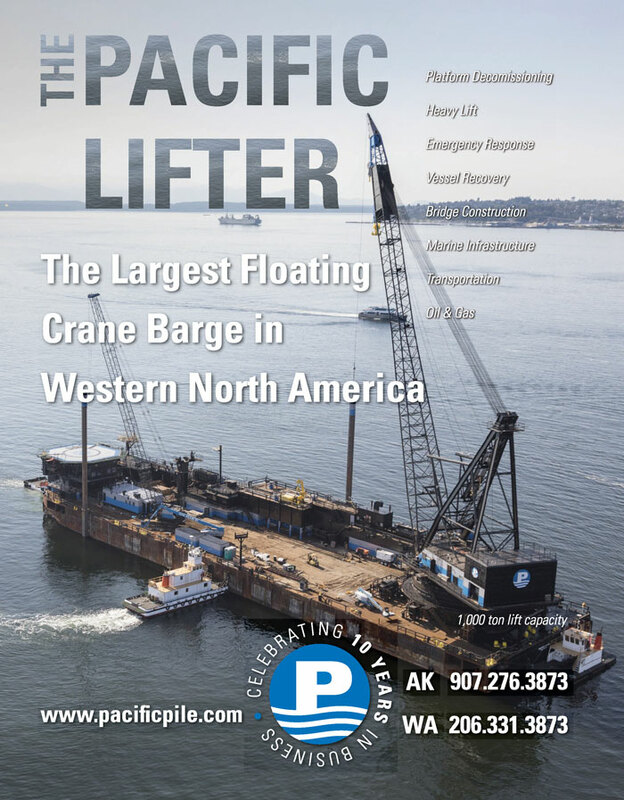 Thank you, Matson, for allowing us to use your Anchorage facility fire suppression systems as the backdrop for our cover and Q&A photos. laska set a stunning example of resilience after the November 30 earthquake, thanks in part to lessons learned from the 1964 Good Friday earthquake that have held up for more than five decades (with a few additions here and there). As news outlets nationwide were lauding the state’s road crews for repairing a partially collapsed off-ramp connecting International Airport Road and Minnesota Drive in Anchorage by December 4—fewer than four full days after the temblor—Alaskans were doing what they do best, getting on with life. Many retailers opened sections of the store they deemed safe the very next day, despite shelves askew, floors dotted with remnants of broken products, and limited staff. Utilities worked to get power and heat to Anchorage and Mat-Su Valley residents… and did so successfully for nearly the entire area the same day. ata is the modern oil, says Danny Maxwell, PMP, ITIL. And it’s essential that organizations recognize its value, protect it—and anticipate that it will have to be recovered some day. Amy K. Mestas, PE, SE, is a registered civil and structural engineer and PDC Engineers’ senior associate leading their structural engineering group. She has a BS and MS in civil engineering from the Illinois Institute of Technology. Mestas serves on the board of the Structural Engineers Association of Alaska where she is the immediate past president, having held the positions of treasurer, vice-president, and president over the past five years. She also serves on the board for the Alaska Professional Design Council and is a member of several other industry organizations. hristine Ness is a fire protection engineer and project manager at PDC Engineers in the company’s Anchorage office. She earned a bachelor of science in mechanical engineering from Bradley University in Illinois and studied fire protection engineering at Worcester Polytechnic Institute in Massachussetts. She earned her Alaska FPE PE in May of 2014, and today uses her expertise in facility life safety hazard analysis and fire suppression and detection systems design to keep facilities and people safe throughout Alaska and beyond. Nominated by the Alaska Chapter of the National Association of Women in Construction, Ness was named the 2018 Engineer of the Year during E-Week last February. Alaska Business is pleased to share a little more about this exceptional woman and her vital work below. e are proud to once again present a glimpse at this year’s Engineering Excellence Project of the Year Awards. The winners of this esteemed award will be announced during Engineer’s Week 2019 occurring February 17 through 23. Congratulations to all the nominees. As more workplaces switch to a flexible and open office concept, it’s not uncommon to see smaller workspaces. In some cases, the traditional 80-square-foot workstation is switching to a 60-square-foot space. hen it comes to office design, taste is subjective. But one thing that most business owners, architects, and interior designers tend to agree on is that today’s offices need to be adaptable. Laura Young, AK Ops Mgr. AECOM Alaska is a team of engineers, scientists, planners, and support staff providing Arctic-smart engineering and environmental services for the complete project life-cycle from permitting for air, water, soils, and solid waste to planning, design, and construction through production and site closure. aeSolutions is a complete system integrator specializing in safety instrumented systems, automation, process safety consulting, industrial cybersecurity, alarm management, and operations and maintenance solutions; supporting all phases of the Process Safety Lifecycle. Workers build and install entrance stairs and a landing for a camp on the North Slope. laska companies vying for oil and gas company contracts to fabricate custom objects and supply materials to the state’s most dominant industry faced increased competition from the Lower 48 after the oil market took a dive several years ago. “The oil market dictates a lot of what happens on the North Slope. Over the last several years, we saw a lot of projects get put on hold or canceled altogether,” says Jim Wohlers, general manager for GBR Oilfield Services. “With the drop in demand came the willingness of some of the larger, out-of-state companies to take on work at much lower rates. Over the past six months, we have seen a gradual increase in projects and work on the North Slope. In addition, over the past several years, we have seen a steady increase in the importance of safety across the field,” he says. A helicopter approaches an oil rig. One of the main uses for helicopters on oil rigs is crew transfers. elicopter services fill a specific need in Alaska’s extraction industries. The mining and oil and gas industries rely on rotary-winged aircraft for everything from site testing to crew changeovers in the vast, remote areas in which these industries operate. With many of the large, legacy helicopter operators based Outside leaving the state to seek higher returns in the last ten years, Alaska’s helicopter services are now dominated by mid- and small-sized operators, explains Chris Maynard, the vice president and director of sales for Pathfinder Aviation. Greg Wolf has been the executive director of the World Trade Center in Anchorage since 2002; he previously served as the State of Alaska’s director of international trade and market development and was the vice president of oversees projects for AEDC. hile some living in the Lower 48 may think Anchorage is at the end of the world, in reality the city is located right in the middle of the world. At least, so far as the aviation business is concerned. The commercial aviation industry has extensive air cargo operations that they perform at Ted Stevens Anchorage International Airport on a daily basis. Situated at the top of the world and near equidistance between Europe, Asia, and North America, the Ted Stevens Anchorage International Airport is less than ten hours by air to 95 percent of major global markets. It serves as the primary link between cities in Asia and North America, as approximately 80 percent of all cargo flights operating across the Pacific make a “technical stop” at Anchorage to refuel, change crews, and (in some cases) to transfer cargo. It is why major integrator airlines like FedEx, UPS, and DHL all have a significant presence at the airport in support of their growing international cargo operations. hina is the world’s largest importer of natural resource commodities, and Alaska is a major American producer and exporter of many of those commodities, so the growing commercial ties between the Middle Kingdom and the Great Land make for a natural, mutually beneficial trading partnership. And, indeed, the dramatic growth of China as an economic powerhouse has fueled continued expansion of Alaska’s international trade economy and has been the headline story for the state’s export community for the past two decades. tate-sponsored investment funds, better known as sovereign wealth funds, continue to rise in economic clout as their assets under management continues to grow and they deploy funds into a broader range of investments. While these government-controlled investment vehicles vary considerably in size and scope, as well as by their particular investment strategies and policies, they are a significant force in the financial markets and their impact can be felt in all corners of the world, including Alaska. Alex Salov is the business operations manager of World Trade Center Anchorage and has been working at the center since 2004; he holds a master’s degree in global supply chain management from the University of Alaska Anchorage. hat comes to mind when someone hears the word “India”? A large country located very far from Alaska. A very populous country home to millions of poor farm workers. At the same time, India also home to millions of highly skilled IT professionals. Many college students encounter professors from India who teach a spread of subjects at major American universities. And last but not least, the Taj Mahal is a major travel destination for many Western tourists. The above statements paint a multifaceted image of India. s the world increasingly turns its eyes northward to the potential of the Arctic, Alaska finds itself uniquely positioned to play a leading role to serve as a gateway and forward base of operations for commercial development in the region. More so than any other state, Alaska has the opportunity to benefit from the economic activity that transpires in the American Arctic. The Arctic opportunity is literally in Alaska’s backyard. Geography doesn’t always deal the best hand; it can, after all, be a curse or a blessing. For Alaska, perched at the top of the world, its location has often worked to its advantage. UA system nursing programs are led out of the University of Alaska Anchorage but are available statewide throughout the system. n 2016 the University of Alaska (UA) launched Strategic Pathways, a plan to “maximize value to Alaska through excellent, accessible, and cost-effective higher education.” An early draft was published in February 2016, and three years later UA has made significant strides in pursuing its goals. According to UA President Jim Johnsen, “Many of the decisions resulting from the Strategic Pathways process have been implemented or are in the implementation process.” For example, within the UA system there used to be three schools of management, but now there are two; there were several procurement processes that have been streamlined into one; multiple email platforms have been turned into one; and several grants and contracting processes have been simplified to one. UAA School of Nursing student Krysta Byford goes over treatment plans with actor Danny Ashton Earll as he portrays a patient about to be discharged during a simulated patient care scenario in UAA’s Health Sciences Building Simulation Center. t’s no revelation that the healthcare industry is experiencing an economic boon in the Last Frontier. Indeed, Alaska boasts the best average wages for several healthcare positions, including optometrists, pharmacists, dental hygienists, and general technologists and technicians. Healthcare employment has recently seen consistent increases—not many sectors in Alaska are seeing that trend. What isn’t common knowledge, however, is the process involved in filling the positions that fuel the growing demand for jobs. ompanies in the tourism industry often work together to provide the best experience for those visiting the Last Frontier. And while this form of cooperative tourism may seem counterintuitive since many of them are competing for the same tourist dollar, such relationships actually benefit all of the parties involved—including the state itself. “Alaska in particular is a unique destination, and everyone in the industry wants the destination to succeed because a rising tide lifts all ships,” explains Jillian Simpson, vice president of the Alaska Travel Industry Association (ATIA). Great Alaskan Holidays’ goal is to provide customers with an amazing experience while also supporting the state’s tourism industry, so they partner with companies ranging from flying services to fishing guides. mall business owners around the state provide local meat options, whether through raising animals in Alaska or processing game meats and fish sourced in the Last Frontier. Below is a range of butchers, wholesalers, and game processors to help you get your meat fix. Veteran social worker and educator Sonya Hunte joined United Way of Anchorage as Vice President for Education Impact. Hunte will oversee United Way’s 90% Graduation by 2020 initiative. She earned a bachelor’s degree in sociology from Penn State University and a master’s in clinical social work from Boston College. Tom Garrett, PE, joined Stantec as a Senior Civil Engineer in the firm’s transportation group in Anchorage. Garrett’s project design experience includes site development, road reconstruction and resurfacing, grading and drainage plans, retaining wall design, and utility main extensions. Garrett holds a bachelor’s degree from the University of Alaska Anchorage and is a member of the Institute of Transportation Engineers. Quality Matters is an international, US-based nonprofit organization that is recognized as a leader in quality assurance for online education. The Online Learner Support Certification recognizes programs that provide all the critical student and academic services needed for learner success and that use learner feedback to continuously improve those services. 12 Rules for Life: An Antidote for Chaos by Jordan B. Peterson and Boomtown: The Fantastical Saga of Oklahoma City by Sam Anderson. I’m usually reading two books at a time. What movie do you recommend to everyone you know? In Harm’s Way – best John Wayne movie ever! What’s the first thing you do when you get home after a long day at work? Kiss my wife Nicole and ask her how her day was. If you couldn’t live in Alaska what’s your dream locale? Buffalo, Wyoming. If you could domesticate a wild animal what animal would it be? Mountain lion. ill Popp has spent more than forty years in both the Alaska private and public sectors. As President and CEO of the Anchorage Economic Development Corporation (AEDC) since 2007, he plans the strategic direction in marketing Anchorage and Alaska to companies and global industries considering Anchorage as a place in which to conduct business and assists local businesses seeking to expand both within Anchorage and Alaska as well as Lower 48 and international markets. Popp is currently chair of the 49th State Angel Fund Business Advisory Committee. And he’s the latest Alaska Business Off the Cuff participant. hough many consider Alaska to literally be the Last Frontier, it is in fact a super hub of import and export activity. In 2017 Alaska exported nearly $5 billion in goods to destinations worldwide. Its top five export markets are China, Japan, Canada, Korea, and Germany. Its top five exports are seafood, minerals and ores, petroleum and coal products, transportation equipment, and oil and gas. R & M Consultants Inc. Thanks for reading our February 2019 issue!